Summer vagrant; recorded breeding in the state in 2010–2011 and probably breeding in 1974. Migration visitant. The Say’s Phoebe was very rare during the Minnesota Breeding Bird Atlas (MNBBA). Widely found throughout the western Great Plains and Great Basin with a disjunct population on the treeless tundra and shrub tundra in Alaska and the adjacent Yukon territory. The highest densities are found in New Mexico, southeastern Utah, and the state of Washington (Figure 1). Short- to medium-distance migrant that winters in the southwestern United States and Mexico; populations in the Southwest are permanent residents. Insectivorous, feeding mostly on wild bees, wasps, winged ants, and many other terrestrial invertebrates. Built in cavities, caves, and arroyo banks or on ledges or cliffs with overhead cover; also in mines, under bridges, and on eaves or other structures with similar overhangs. It will use the same nest in subsequent years. Unlike other phoebes, it usually does not use mud in nests. Breeding distribution and relative abundance of the Say’s Phoebe in North America based on the federal Breeding Bird Survey, 2011–2015 (Sauer et al. 2017). At the time that Roberts was gathering information for his 1932 book on Minnesota avifauna, there were no records of the Say’s Phoebe in the state. The first documented observation (September 3, 1963) was of a migrant found in Winona County (Einhorn 1969). Subsequently, a specimen was discovered in the collection at the College of St. Benedict, Stearns County, presumably found on campus in May 1967 (Eckert 1968). Another migrant was observed (September 3, 1973) on a roadside power line in Rock County (Eckert 1974). The next year, breeding territorial behavior, but no actual nest, was observed on many occasions from April 3 to July 14, 1974, at Blue Mounds State Park, Rock County (Eckert 1975). With two notable exceptions, all reports following the 1974 probable breeding occurrence at Blue Mounds were migration records. The migration observations can be categorized based on geography and timing: (1) those seen away from the prairie in both spring and fall (April 29 to October 25), and (2) those found in the spring along the western border with the Dakotas. In the first category, six records are from two migration hot spots on the North Shore (French River, September 24, 1975, 2007, and McQuade Harbor, Lakewood Township, October 6–11, 2012). Seven other migration records are from several counties in eastern Minnesota (Olmsted, September 26, 1988; Dakota, September 3, 1998; Clearwater, April 29, 2002; Aitkin, October 25, 2005; Sherburne, September 9, 2007; Anoka, May 12–13, 2009; and Fillmore, April 21–22, 2012). In the second category, the Say’s Phoebe has been observed only in the spring, sporadically from the 1980s to the 2000s, with three observations of single birds each decade. All have been found along the far western prairie counties (Big Stone, Clay, Lac qui Parle, Murray, Polk, Rock, and Wilkin) and mostly in May. With two exceptions described later, the records could represent either migrants or wandering birds looking for suitable territory. There are two records where the Say’s Phoebe lingered into summer at sites with suitable habitat, but no documented breeding evidence was obtained (Blue Mounds State Park, Rock County, May 29 to June 11, 1988 (Hamernick 1988; Wiens 1989); and Felton Prairie, Clay County, May 14 to July 2, 2005 (pair) (Svingen 2005; Brunell 2006). In the years from 2000 to 2013, an unprecedented number of records from the prairie counties could be categorized as either migrants or potential territorial birds. Excluding the records from eastern counties mentioned earlier and summer records, 12 spring records (April 29 through May 22) occurred in 9 western border counties. Clay County had the most records (2004, 2005, 2010, and 2013), which may only reflect that the Felton prairie complex is a popular birding site or it may indicate suitable breeding habitat. Because of the relatively large number of records from 2000 to 2013, the Minnesota Ornithologists’ Union changed the classification of the Say’s Phoebe from casual to regular in 2015 (Tustison 2015). Hopefully, this does not lead to fewer field reports that could help improve the knowledge of site and habitat use, breeding evidence, and population trends of the Say’s Phoebe in Minnesota. Because the Say’s Phoebe was assumed to not nest in Minnesota, it was not on the species list for data entry into the MNBBA. Therefore, it was not possible for observations during the atlas years to be put in the Cornell database. However, records in the published and online MOU databases are summarized here. The most important finding was documentation of breeding in Florida Township, Yellow Medicine County, where a pair was observed from June 16 to July 26, 2010, by a dozen people at various times, and a nest with eggs was photographed on July 25, 2010 (Hertzel et al. 2011). From the description in the Loon article, the nest was found on the bridge over Florida Creek in atlas block T115R46a. Birds were observed the next year at the same site and “used the same nest as the previous year, producing a clutch of six” (Kessen and Svingen 2012). This information was converted to two MNBBA confirmed breeding records, one each for 2010 and 2011, and is displayed as one block in northwestern Yellow Medicine County (Figure 2). Two spring observations of a single Say’s Phoebe were made at the Felton prairie complex in Keene Township (atlas block 141r45d) on May 13 and May 27, 2013 (Tustison 2013; Budde et al. 2013). However, these were not the first records of the species in the area. A pair was discovered at the north gravel pit on the Felton prairie complex (atlas block T142R45c) on May 15, 2005 (Brunell 2006), and was seen approximately a dozen times by many observers through July 2, 2005 (Svingen 2005), but no breeding evidence was obtained. Subsequently, a Say’s Phoebe was observed on July 27, 2005, on the gravel road to the south (Svingen 2006). Part of the Felton prairie complex is a designated Minnesota Department of Natural Resources Scientific and Natural Area. More intensive avian monitoring of this large grassland complex would be useful in understanding prairie species like the Say’s Phoebe, which is on the periphery of its breeding range in this landscape. Because the 2013 sightings were not during the breeding season, they were not added to the MNBBA database. In states that are adjacent to Minnesota, the Say’s Phoebe is found breeding in North Dakota (mostly west of the Missouri River; Stewart 1975), South Dakota (summer throughout but scarce in the eastern counties, Tallman et al. 2002), Iowa (1960–1972, nested, two northwestern counties, Kent and Dinsmore 1996; same area, first breeding bird atlas 1966–1991, Jackson et al. 1996; but no records during the second breeding bird atlas, 2008–2012), and the province of Manitoba (southwestern corner, Manitoba Breeding Bird Atlas, 2010–2014). Breeding distribution of the Say's Phoebe in Minnesota based on the Breeding Bird Atlas (2009 – 2013). Summary statistics for the Say's Phoebe observations by breeding status category for all blocks and priority blocks (each 5 km x 5 km) surveyed during the Minnesota Breeding Bird Atlas (2009-2013). The Say’s Phoebe adapts to human land use and structures in dry, open country within many landscape types: tundra, savanna, prairie, farmland, ranches, badlands, sagebrush flats, scrub, canyons, and cliffs. It avoids forested areas and wet lowlands. Nest site availability may be a constraint on the species’ use of a given habitat. Occupancy at the eastern edge of its range in Iowa and Minnesota is sporadic and may be linked to climatic conditions of dry versus wet years (Kent and Dinsmore 1996). Partners in Flight estimated the population of the Say’s Phoebe at 5.1 million in the United States and Canada (Rosenberg et al. 2016). The federal Breeding Bird Survey shows that the Say’s Phoebe population is stable or significantly increasing throughout all regions that have a suitable sample size (Sauer et al. 2017). 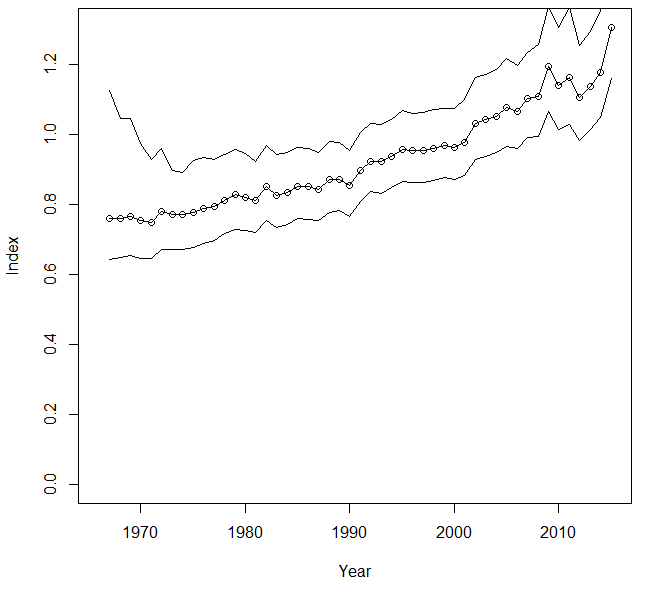 For instance, survey-wide the species is significantly increasing by 1.14% per year (Figure 3). Rosenberg et al. (2016) estimated that the population has increased by 40% from 1970 to 2014. Breeding population trend for the Say’s Phoebe survey-wide in the United States and Canada for 1966–2015 based on the federal Breeding Bird Survey (Sauer et al 2017). The Partners in Flight Continental Concern Score of 9/20 indicates a low conservation concern score for this species, especially since its population is increasing and because it has a wide breeding distribution (Rosenberg et al. 2016). Because the Say’s Phoebe readily nests in human structures, its numbers may have increased historically with the creation of settlements in the West (Mollhoff 2016). However, there is no information on how modern agricultural practices or land use might affect this seemingly adaptable species (Schukman and Wolf 1998). Brunell, Conny M. 2006. “Two Say’s Phoebes in Clay County.” Loon 78: 56–57. Budde, Paul E., Robert M. Dunlap, Doug W. Kieser, James W. Lind, and William C. Marengo. 2013. “The Spring Season, 1 March through 31 May, 2013.” Loon 85: 165–198. Eckert, Kim R. 1968. “Say’s Phoebe and Ground Dove Specimens Found.” Loon 40: 18–19. Eckert, Kim R. 1974. “Say’s Phoebe and Barn Owl Observed in Rock County.” Loon 46: 37–39. Eckert, Kim R. 1975. “Possible Say’s Phoebe Nesting at Blue Mounds State Park.” Loon 47: 13. Einhorn, C. M. 1969. “Say’s Phoebe Seen in Minnesota.” Loon 41: 10–11. Hamernick, Jay. 1988. “Say’s Phoebe at Blue Mounds Park.” Loon 60: 129. Hertzel, Anthony X., T. Benjamin Hertzel, and Robert M. Dunlap. 2011. “Say’s Phoebe (Sayornis saya) Nesting in Minnesota.” Loon 83: 6–9. Jackson, Laura Spess, Carol A. Thompson, and James J. Dinsmore. 1996. The Iowa Breeding Bird Atlas. Iowa City: University of Iowa Press. Kessen, Ann E., and Peder H. Svingen. 2012. “The Summer Season, 1 June through 31 July 2011.” Loon 84: 20–46. Mollhoff, Wayne J. 2016. The Second Nebraska Breeding Bird Atlas. Bulletin of the University State Museum, no. 29. Lincoln: University of Nebraska State Museum. Svingen, Peder H. 2005. “Proceedings of the Minnesota Ornithologists’ Union Records Committee.” Loon 77: 169–174. Svingen, Peder H. 2006. “Proceedings of the Minnesota Ornithologists’ Union Records Committee.” Loon 78: 126–133.